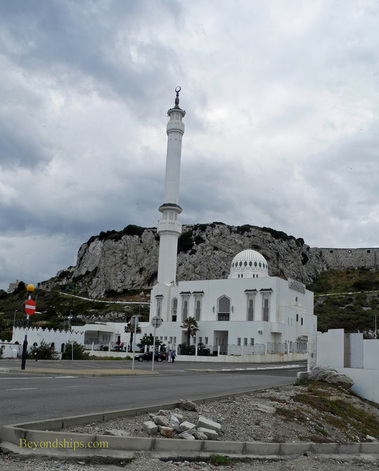 Above: The Moorish Castle which overlooks the city from the western slope of The Rock is a reminder that Gibraltar was occupied by the Moors for 710 years. All that remains of the once sprawling castle is the Tower of Homage and the gatehouse. It was here, in 1704, that Admiral Rook first raised the British flag which has flown over Gibraltar ever since. 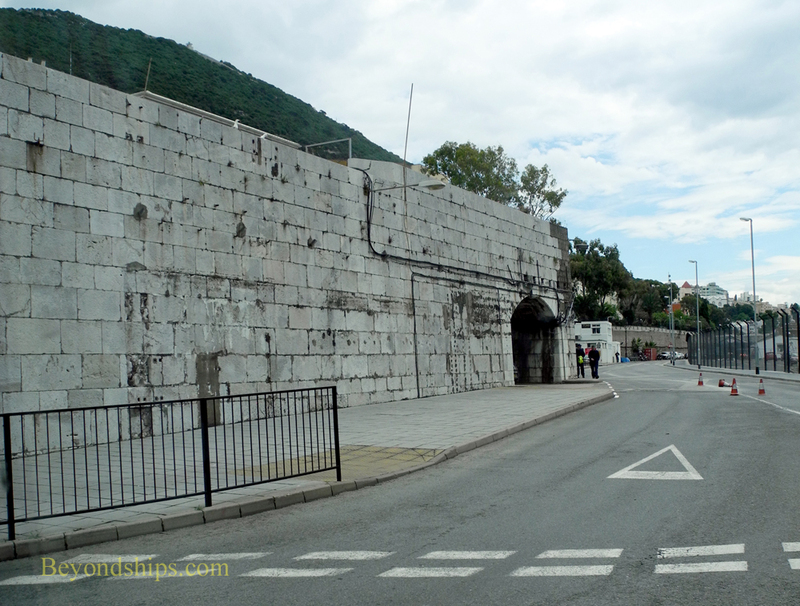 Above and below: Defensive works are still visible throughout Gibraltar. Above: Europa Point Lighthouse stands at the southern most end of Gibraltar where the Mediterranean meets the Atlantic. There have been beacons here since ancient times. This lighthouse, however, dates from 1841. 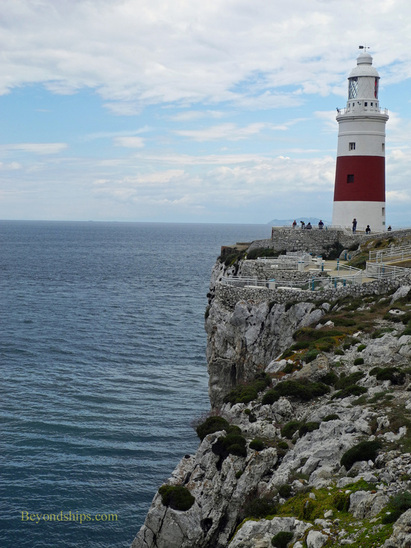 Below: Europa Point has long had religious connections. In 1492, at the end of the Christian Reconquest of the Iberian Peninsula, an existing mosque was converted into The Shrine of Our Lady of Europe. The successor to that shrine still stands at Europa Point today. Nearby is the Mosque of the Custodian of the Holy Mosques, a gift from the late King Faud of Saudi Arabia in commemoration of the Moors contribution to Iberia. People in the Ancient World knew that Gibraltar, its rock and the straits were created by the hero Hercules. In order to carry out one of the twelve labors set for him by the Gods, Hercules had to traverse a mountain. Rather than climb the mountain, he used his superhuman strength to cleave the mountain thus creating the Rock of Gibraltar to the north and the mountain Jebel Musa to the south. In the process of creating the Pillars of Hercules, he also connected the Mediterranean to the Atlantic, today's Straits of Gibraltar. Not content with this straightforward explanation, modern scientists have developed the theory that the Rock was created when the African continental plate collided with the European plate. Then about five million years ago the Atlantic burst through and flooded the area that is now the Mediterranean thus creating the Straits. There is evidence that the area was once inhabited by Neanderthals. Much later, the Phoenicians, the Carthaginians and the Romans visited the area, which was considered the end of the known world. After the fall of the Roman Empire, the area came under the control of the Visigoths. The first permanent settlement came when the Moors invaded Spain in 711 A.D. Over the next six centuries, a castle was built and the town fortified. However, these proved inadequate when Gibraltar was besieged by Christian forces seeking to drive the Moors from Spain. 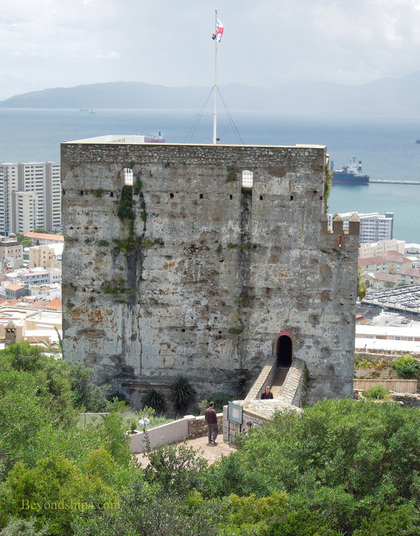 Sixteen years later, in 1333, the Moors re-captured Gibraltar and held it through several more sieges. In 1462, the Christians again captured the city and expelled its Muslim inhabitants. After the Reconquest of Spain was completed, Gibraltar became property of the Spanish crown. Its economy declined during this period as other nearby ports grew in importance. The city was attacked by Barbary pirates who carried off many of the inhabitants as slaves. Also, during the 80 Years War, a Dutch fleet destroyed a Spanish fleet in the Battle of Gibraltar. In 1704, a combined British and Dutch force under Admiral Sir George Rooke successfully besieged Gibraltar during the War of the Spanish Succession. When the Spanish garrison left, so too did most of the city's inhabitants. Subsequently, Span and her ally France made several attempts to retake Gibraltar and the task of defending the city fell to the British. Accordingly, in the Treaty of Utrecht, which formally ended the war, Spain ceded Gibraltar to Great Britain. Since then Spain has regretted this concession. Within a few years, it built a line of fortifications separating the Gibraltar peninsula from Spain and essentially closed the border making the British rely on the sea for supplies. 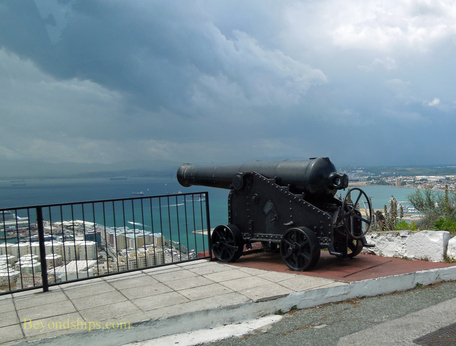 Then during the American Revolutionary War, a combined French and Spanish force besieged Gibraltar from 1779 until 1783 in what is known as “The Great Siege.” However, the British were able to resist their attacks and Gibraltar remained under British control. During the Napoleon Wars, Gibraltar was a key naval base for the British. It was important as a base in the British blockade of Spain and France and for the Battle of Trafalgar in which the British under Lord Horatio Nelson defeated the combined French and Spanish fleets. It subsequently served as a supply base during the Peninsular War. Refugees from many parts of the Mediterranean settled in Gibraltar giving it a diverse population. Gibraltar continued to have strategic importance throughout the 19th Century. British ships sailed through the Mediterranean in order to get to Egypt and to India. Therefore, the naval base at Gibraltar was expanded. The naval base again played a significant strategic role in World War II, giving the British control over traffic between the Mediterranean and the Atlantic. Ships based there were used in the North Africa campaign as well as in the Battle of the Atlantic. Because of concerns that Gibraltar might be attacked, its defenses were significantly enhanced (see separate article). After the war, dictator Francisco Franco reasserted Spain's claim to Gibraltar. Britain refused to accede to this claim on the ground that the inhabitants of Gibraltar wanted it to remain a British territory. Franco in turn closed the border. After his death, the border was reopened and many Spanish citizens cross it each day to work in Gibraltar. British military cutbacks in the second half of the 20th Century caused major reductions in the forces stationed in Gibraltar. Since the Gibraltar economy was heavily dependent on military spending, this led to an economic shift to an emphasis on tourism and on financial services.